Fingertip injuries may involve skin, bone, nail, nail bed, tendon, and the pulp, the padded area of the fingertip (see Figure 1). The skin on the palm side of our fingertips is specialized in that it has many more nerve endings than most other parts of our body. These nerve endings enable the fine sensation we have in our fingertips, and they can also be damaged. When this specialized skin is injured, exact replacement may be difficult. Fingertip injuries are one of the more common injuries in the hand. The fingertips are exposed in many of our activities. They can be crushed, such as by a closing door, a hammer, or a heavy object dropped onto the finger. They can be cut with a knife or power tool, such as a saw, sander, lawnmower, or snow blower. It is important to know how the fingertip injury occurred, and about any medical problems, as these can factor into deciding about treatment. Examination reveals the extent of tissue injury and its size. Sensation and circulation of the tip are assessed. Mobility of the tip is also checked, as injuries can occur to the tendons that bend or straighten the fingertip (see extensor tendon and flexor tendon injuries). X-rays are often needed to see if the bone has been injured. Severe crush or avulsion fingertip injuries can completely remove some or all of the tissue at the fingertip. If just skin is removed and the defect is less than a centimeter in diameter, it is often possible to treat fingertip injuries with simple dressing changes. If there is a little bit of bone exposed at the tip, it can sometimes be trimmed back slightly and treated with dressings,too. For larger skin defects, skin grafting is occasionally recommended. Smaller grafts can be obtained from the little finger side of the hand. Larger grafts may be harvested from the forearm or groin. If there is nail bed injury, it is repaired. When patients lose more than skin and have exposed bone, the fingertip injury may need to be covered with a flap of skin that has some soft tissue with it for padding. Small wounds on the tip of the finger may be covered with a flap from the injured finger. 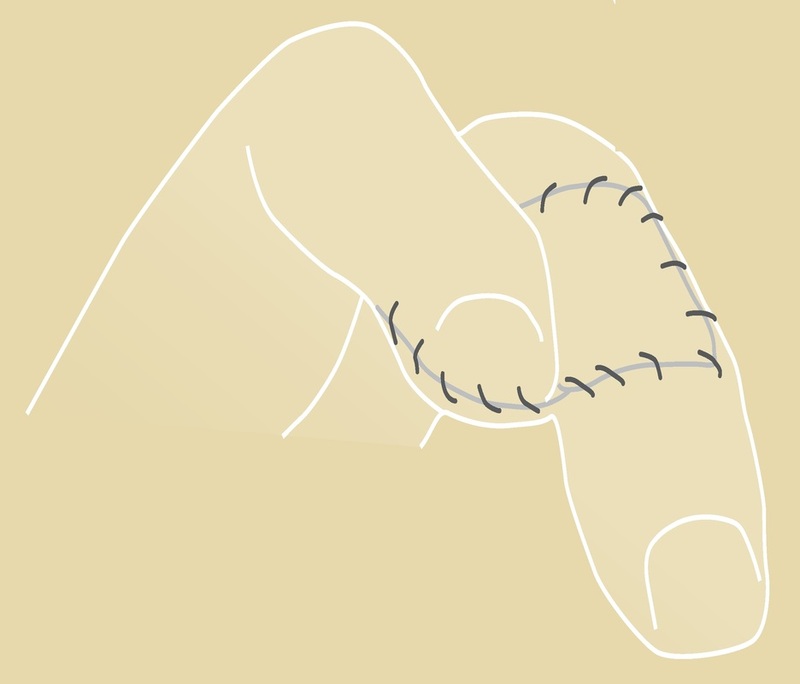 Larger wounds, such as those that result in substantial loss of the pulp, require a flap that is elevated from an adjacent finger (see Figure 2a and 2b) or other source. The flap remains attached to its original site so that it has blood supply while it is stitched to the finger wound. A skin graft is used to cover the donor site defect. After a few weeks the flap has sufficient blood supply coming from the injured finger as it heals into its new location, and can be divided from its origin and fully set into the wound. Fractures of the bone in the tip of the finger are common. Very small fractures of the end or tuft of the bone usually do not affect the strength of the bone. Repair of the soft tissue, such as the nail bed, usually re-aligns and stabilizes these bone fragments. Fractures closer to the joint may require a splint or even a temporary metal pin(s) to hold the bone fragments in proper position. If the damage is too severe, amputation of the fingertip may be necessary. Figure 2b. Cross-finger flap end result. ​What to Expect After Fingertip Surgery? Fingertip sensitivity is common and may last for many months. Sometimes the feeling in the fingertip is limited. The contour may have some distortion, and the quality and texture of the skin may be different than the very specialized skin that normally covers the fingertip. There also may be some deformity at the donor site of a graft or flap. Stiffness can be a concern, especially if a flap is needed. If there is a nail bed injury that is sharp and can be repaired, a normal nail is likely. If there is more severe crushing of the nail bed, then there is a greater likelihood of nail bed scarring and subsequent deformity of the nail.